Read any interview with a dermatologist and they’ll likely claim retinol as the gold-standard of skin care—at least for people who are looking for youthful-looking skin. A form of vitamin A, retinol is often found in anti-aging products since it’s been shown to reduce the appearance of fine lines, wrinkles, environmental damage and even blemishes. With countless retinol-based products on the market, it can be confusing to figure out which retinol product will decrease the likelihood of irritation. One option is to start with a milder formula and work your way up as your skin builds tolerance. Start with over-the-counter retinol products, as they tend to be less powerful than their prescription counterparts. It’s also important to consider the way the product works. When it comes to choosing a retinol product, one factor that plays a big is the type of delivery system used to introduce the retinol into the skin. 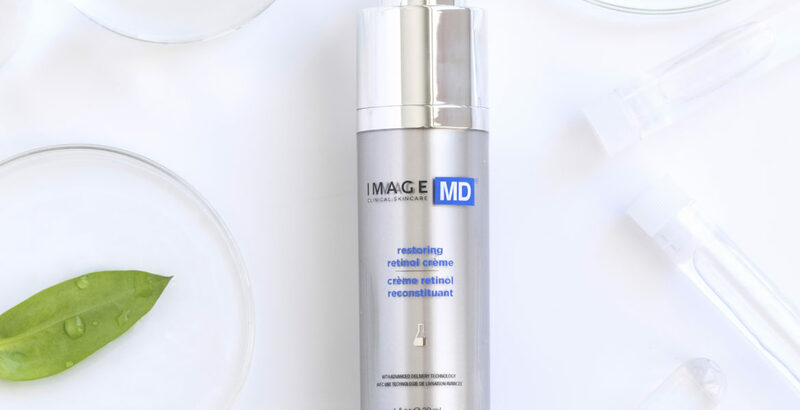 At IMAGE Skincare, we use a unique delivery system for the retinol in many of our products called Kemspheres™. These oil-soluble encapsulations deliver actives, such as retinol, in a stable form to maximize effectiveness while reducing the chances of skin appearing red and irritated. Not everything in your bathroom cabinet will be compatible with a retinol-based product. Before you start adding retinol into your skincare routine, go through what you have—and be open to the idea that you may need to make some changes. For instance, a product with AHA (or alpha hydroxy acid, which exfoliates the upper layers of the skin to create a smoother finish) or salicylic acid (often used to deep clean acne-prone skin) will typically not complement retinol. This interaction can lead to extreme discomfort. Additionally, creams with benzoyl peroxide (an ingredient used to treat signs of acne and breakouts) can compromise the effects of retinol products. For best results, reach for items that contain peptides (an anti-aging ingredient linked to younger-looking skin), apply sunscreen diligently and avoid cleansers or toners that might be considered harsh. Simply rethinking your regular skin care routine can decrease the severity of common retinol-related side effects. You should also introduce hydrating products into your skincare regimen when using retinol to combat any dryness that may occur. As with all water-based formulas, it’s a good idea to apply to freshly cleansed skin and then layer oil-based products on top. This will help lock in moisture. Another way to fight against dry skin, redness and a tight complexion is to incorporate additional moisturizing products into your routine. A soothing sheet mask is a wonderful option and can be used two to three times per week. Last but not least, introduce any retinol-based product to the skin slowly. Start one to two times a week, nighttime only, and then increase frequency as the skin builds up a tolerance. It’s equally important to listen to the skin. While some users may be able to use retinol twice a week to start, others may experience a reaction. For those who fall into the latter category, be aware and cut back as necessary. That may mean using a product once a week to start instead or switching to an item that contains a lower percentage of retinol. Get Revved Up Over Retinol!